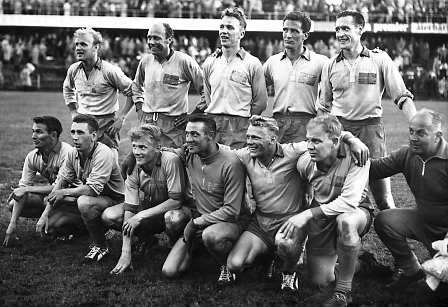 Swedish squad at the 1958 FIFA World Cup. England entered the 1950 finals as winners of the Home Nations. England started a habit of a lifetime and struggled in the group stages. They lost 1-0 to both the USA then Spain, but did beat Chile 2-0. The Foreign Office reported on the performance of England (1950, AB1801 file), but unfortunately this file has not been retained. The National Football Museum holds the Boys’ Book for 1950 with an article by the manager, Walter Winterbottom, on England’s performance and why England could no longer be considered the best in the world. The next finals in 1954 was a unique seeded v unseeded system, which saw England group winners having drawn and beaten the two unseeded teams. They did not play the other seeded team in their group. Uruguay sent England (4-2) home early that year. The 1958 finals went to Sweden. England kept Brazil to a 0-0 draw, the first in any World Cup finals. They then lost the playoff to the Soviet Union. Arguably the greatest player ever, Pele, scored the winner for Brazil as they beat Wales 1-0 in the quarter finals. Chile hosted the 1962 finals. England was the only Home Nation to reach the finals, and after struggling to second place in the group, were knocked out 3-1 by Brazil, the eventual winners. 1970 saw the Foreign Office more interested in Rhodesia’s participation in Mexico than England’s performance, (FCO 36/326). Rhodesia had declared itself independent from the United Kingdom in a move was declared illegal by Prime Minister Harold Wilson (PREM 13) and the United Nations Security Council. Rhodesia applied to enter the 1970 World Cup. The Foreign Office objected to this, but Rhodesia had support from the secretary of FIFA, Sir Stanley Rous. Sir Rous had spent time and effort in ensuring Rhodesia could play in the qualification. The Foreign Office decided not to try and intervene. In bizarre fashion, Rhodesia was grouped in the Asia Group 15a to play a two legged ‘group’ game against Australia. Both games ended as a draw, with Australia winning the ‘play-off’ 3-1. Israel eventually won the Asia group, but soon after left the Asian Football Federation. They are now a member of UEFA, and play in the European Zone. Also to note: this is the only year, to date, Argentina have failed to reach a finals. So what does this all tell us about England and why they fail to live up to the expectations of fans and press alike? That is always up for debate, but just remember the next time someone says: ‘don’t worry, it’s just a game’. Look back and think no, it’s not. It is more than a game; it is the pride of a nation, and the hope for the next generation. I’ll leave you with this extract from the Daily Express, 1929 (FO 395/434 folio 230).